In 1864, Napoleon III (Claude Rains, Casablanca) of France seizes control of the Mexican country and establishes a monarchy with the help of puppet leader Archduke Maximilian of Austria (Brian Aherne, Merrily We Live) and his wife Carlota (Bette Davis). 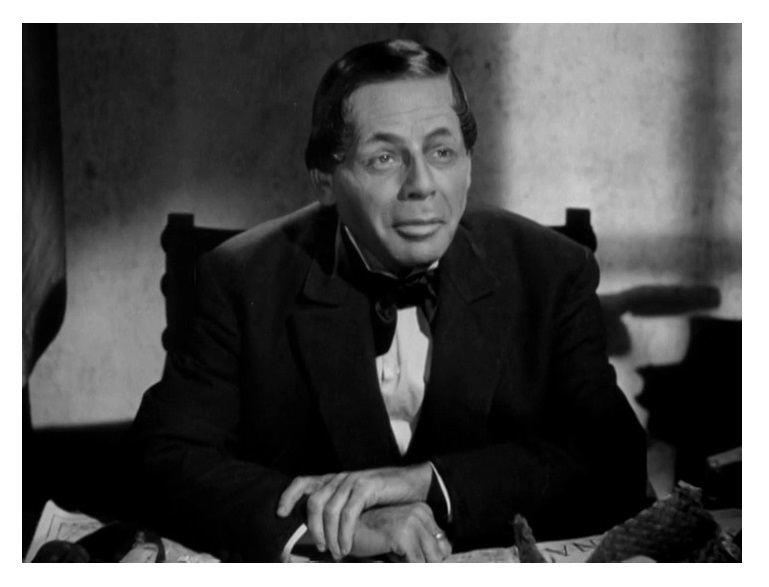 Mexico’s elected president, Benito Juárez (Paul Muni, Bordertown), goes into hiding, but he soon organizes his sympathizers and mounts a campaign to win the country back. This is essentially two movies in one. 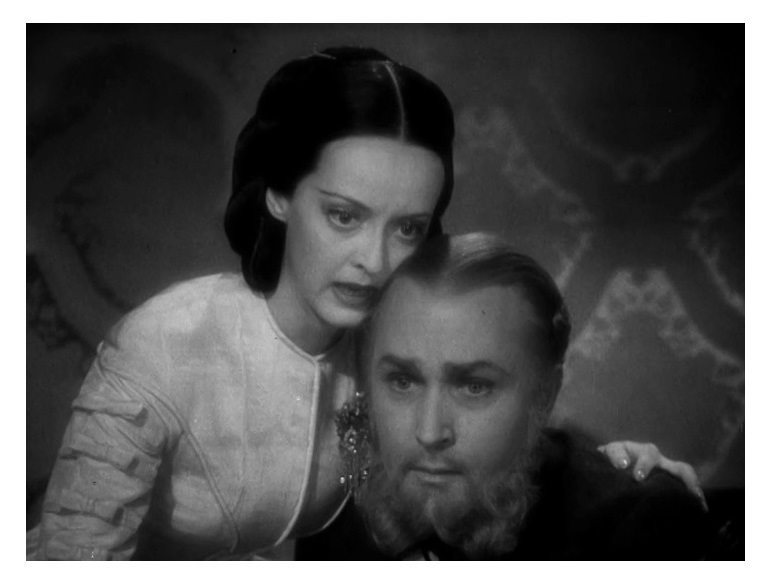 In fact, the movie was based on two sources: Bertita Harding’s The Phantom Crown (the film’s original title), about Emperor Maximilian and his wife, and Franz Werfel’s play Juárez and Maximilian. 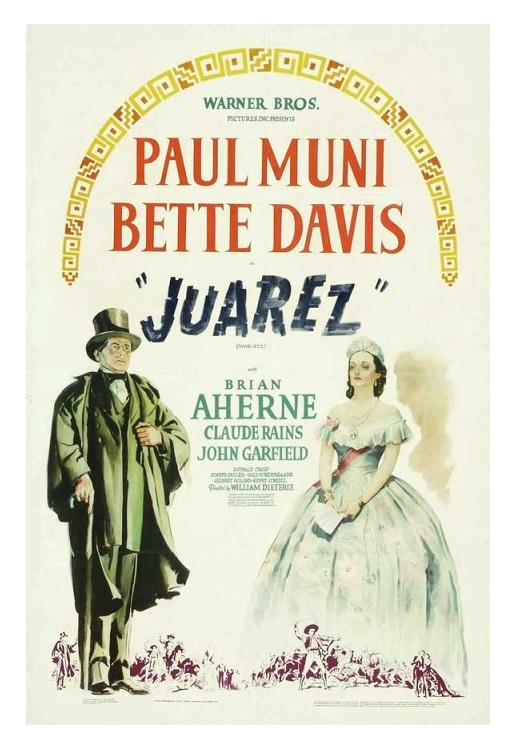 Directed by William Dieterle (Portrait of Jennie) from a screenplay by Aeneas MacKenzie, Wolfgang Reinhardt, and John Huston (The Maltese Falcon), Juárez goes back and forth between Maximilian’s attempts to rule the country and Juárez’s struggles to regain power. This kind of narrative device requires fine balance. You don’t want one story to overshadow the other. You also want the interaction between the two stories to create sparks — I thought that the ambitious stunt worked exceedingly well. In her autobiography The Lonely Life, Bette Davis accused Paul Muni of trying to upset the film’s fine balance by demanding cuts that favored his section of the movie. I’m not sure I believe that because the Davis-Aherne section has as much screen time as Muni’s — it wouldn’t have worked any other way. All actors are at the top of their games here. It is true that Muni’s once celebrated method acting hasn’t aged well. Not as well as Bogart’s or Cagney’s less naturalistic styles anyhow. But I do like him and I thought he did a very good job as the beloved Mexican leader (Perc Westmore’s meticulous make up helps a great deal). Aherne’s Oscar-nominated performance is better, though. He makes the character of Maximilian seem real, alive — it’s probably the best performance Aherne has ever given. My personal favorite is Claude Rains’s Napoleon III. He’s unforgettable as the cunning, manipulative French monarch. Rains has an electrifying confrontation with Davis — it’s my favorite moment in the entire film. 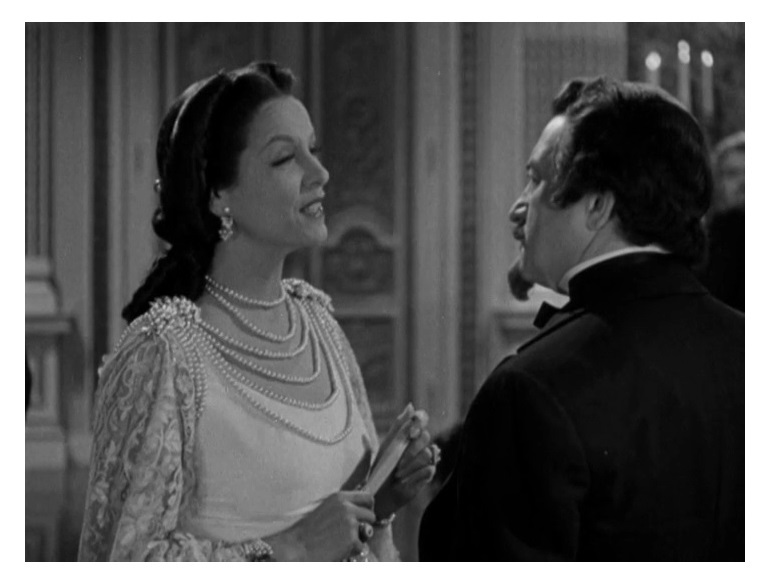 The big cast also includes Gale Sondergaard (The Letter) as Empress Eugenie, John Garfield (Body and Soul) as Porfirio Diaz, Donald Crisp (National Velvet) as Marechal Bazaine, Gilbert Roland (The Bad and the Beautiful) as Col. Miguel Lopez, and Louis Calhern (Notorious) as LeMarc. Juárez is a gorgeous-looking production. The impressive sets were designed by Anton Grot (Anthony Adverse). Orry-Kelly’s (Mr. Skeffington) costumes are pure genius. For example, Carlota’s wardrobe matches her state of mind — white for the early happy scenes, darker colors as her mind begins to deteriorate. Erich Wolfgang Korngold (The Private Lives of Elizabeth and Essex) wrote the truly majestic music score. Overall, Juárez is a somewhat underrated historical drama with a fantastic cast and top production values. B&W, 125 minutes, Not Rated. Excellent review, Eric! I watched this movie recently. Yes, most underrated! It’s a really good, very interesting historical epic.